Lisa, a registered physical therapist, grew up in Falmouth. She graduated from Falmouth High School in 1982. Being the daughter of a physician, during high school she became interested in being a physical therapist, not wishing to follow entirely in the footsteps of her father. She then earned her Bachelor’s degree in Physical Therapy from Simmons College in 1987. 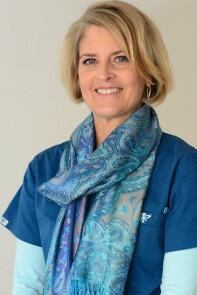 Lisa’s career began in Delray Beach, FL, where she worked at Pinecrest Rehabilitation Hospital for 2 1/2 years. She spent time working with inpatient and rehabilitative care patients. She gained experience through working with various neurologically involved patients, some with spinal cord injuries, traumatic brain injuries, strokes, and Multiple Sclerosis. Finally, Lisa also worked with diabetic patients and wound care. Following her variety of experiences, Lisa’s passion remained in outpatient care. This led to her next position at Cralle Physical Therapy, a private practice in Jupiter, FL, where she worked for 2 1/2 years. Lisa married while living in FL and gave birth to her first child. She and her family moved back to Falmouth in 1992 to be closer to family and open her physical therapy practice. Her husband Gus has managed the office since 1992. Lisa’s practice has grown over the years, with most of her staff having been students or employed as P.T. aides, and progressing to become Physical Therapists or Physical Therapist Assistants. She has experienced very low turnover of her employees since practicing in Falmouth. Lisa has been a classically trained Pilate’s instructor since 2009. She is also a certified Graston technique provider. Graston technique uses instruments to provide soft tissue mobilization. In addition to being the proud mother of three children, Lisa enjoys walking, playing tennis, cooking, Pilates, knitting and spending time with her family and two dogs.